This concert presents the seriously enticing combination of fortepiano and period string quartet, led by the incomparable Alina Ibragimova. Joining her in this very high calibre ensemble are the Spanish violinist Pablo Hernán Benedí, the Swedish violist Emilie Hörnlund and cellist Claire Thirion from France. 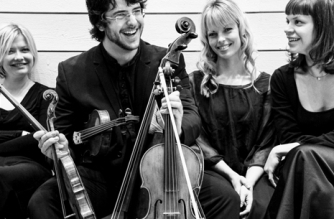 Together, they perform music of the Classical and early Romantic periods on gut strings and with historical bows, and their unique sound – described in The Observer as ‘a shock to the ears of the best kind’ – is highly acclaimed by audiences and critics all over Europe. They are joined by Kristian Bezuidenhout, one of the world’s most admired specialists of the fortepiano – the instrument that Mozart and Beethoven wrote for and played themselves.